Most pet owners find they need to order their pet supplies on a regular basis. Schedule an order for delivery every one, two, or three months – whichever works best for you and your pets with our repeat delivery service. How do I set up repeat delivery? Simply find your pet’s favourite products, pick your preferred size and quantity, and then select the delivery frequency of your choosing from the dropdown. We’ll notify you every time an order is being delivered and we’ll always make sure you get the best deal on the day of your scheduled delivery. You can amend your order and pause it at any time. And, you’ll get 10% off your first repeat order. Burns Choice Lamb & Maize is a delicious hypoallergenic food for adult dogs designed to provide your pooch with complete nutrition. Burns Choice replaces the rice of Burns Original - which can sometimes disagree with certain dogs - with maize, a less common carbohydrate that is far less likely to cause problems for your pet. Just like Original, Burns Choice is free from frequent sources of irritation such as wheat, gluten, beef, and dairy, making it highly hypoallergenic. 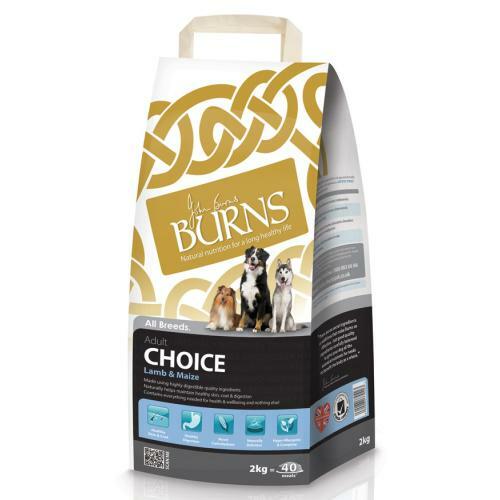 Made from quality lamb and wholegrain maize, Burns Choice is free from artificial colours and flavours to reduce occurrences of itchy skin, tummy upsets, bad breath, and excessive moulting, instead promoting the production of friendly intestinal bacteria for prime digestive function, and helping to maintain a glorious, luxuriant coat. Whole Grain Maize (69%), Lamb Meal (22%), Peas, Sunflower Oil, Seaweed, Vitamins & Minerals.